The Ottoman Empire ruled Palestine until 1918. During this time, Tzfat was viewed as the capitol of the North, and many countries had Consulates in Tzfat to tend to their interests. Such was the case of the Austro-Hungarian Empire, whose Consulate was located on the Northern border of Tzfat's Old Jewish Quarter. The Consulate held an important role in the area, as they were responsible for issuing "piramens", or visas, to people who wished to visit any of the lands of the Austro-Hungarian Empire or, indeed, anywhere in Europe. At the same time, after the Arab riots of 1929, , the building began to be used as an induction point for the pre-State Jewish para-military underground, the Haganah. The British soldiers who were in charge of the area had strict orders to halt any self-defense activities on the part of the Jews, so the doctors and nurses worked in the open, while the Haganah conducted its activities secretly. The building's official status as a maternity hospital gave the Haganah the opportunity to induct and train new recruits as well as store weapons, since the British soldiers were too polite to raid a hospital with women in childbirth. The Berenson family bought the building after the War of Independence and began to convert the building into a hotel in the early 1950s. 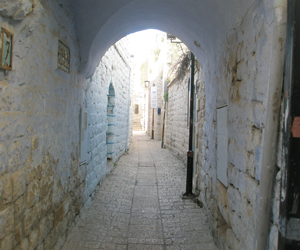 The Tel Aviv was known throughout the country as a pleasant place to vacation, and many people who lived in Israel during the early years of the State can recall vacationing in Tzfat at the Tel Aviv. The hotel served families and couples, but government officials and many leaders of Israel vacationed there as well. Today, the Tel Aviv is known as one of the Old Jewish Quarter's most pleasant hotels. Its rooms are small and simple, but quite clean and airy. The hotel has been extensively renovated in recent years, so the furnishings are new and comfortable. The hotel has 40 rooms equipped with Color TV, Cable, Air Conditioning and spectacular views of the Galilee and Safed. Breakfast is available for a small extra charge, and meals may be ordered (and eaten in the hotel's dining room) on Shabbat and holidays. To contact the hotel, please phone 972-4-6972555.